Integral to the area’s past, these organizations define South Lake Union today and will continue sculpting its character well into the future. South Lake Union is a neighborhood defined by change. Over the last few years, empty warehouses have transformed into company headquarters, trendy restaurants, and mixed-use buildings. All the while, SLU has managed to retain its original character thanks to the intrepid businesses, nonprofits, and research institutions that have called the neighborhood home for decades. These pioneers saw potential here before anyone else and laid the foundation for what is now the city’s hottest neighborhood. It’s a quintessential sight in the Northwest—seaplanes cruising onto and soaring from Lake Union, their deft pilots threading between boaters and kayakers all summer long. The 580-acre lake is a Federal Aviation Administration–designated airport, with a large chunk of flights coming from one source: Kenmore Air. Founded in 1946 along the shores of Lake Washington, the aviation firm has offered flights from Lake Union for decades. That operation was enhanced in 1992, when the company purchased Lake Union Air, its biggest competitor at the time. 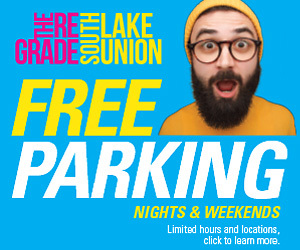 Today, Lake Union flights are an integral part of Kenmore Air’s business. Amid the recent flurry of restaurant openings in South Lake Union, 13 Coins remains a steadfast anchor. Known for its high-backed swivel chairs and booths, the eatery has been serving everything from benedicts to steaks 24 hours a day, seven days a week, since 1967. While the restaurant has expanded—13 Coins boasts locations in SeaTac and Bellevue, with a Pioneer Square location in the works—the original SLU outpost remains iconic. All-night restaurants have long been the domain of fast food joints and greasy spoons, but 13 Coins fills a void for round-the-clock upscale-casual cuisine. In an ever-changing area, the venerable institution has learned to adapt. A California developer plans to erect a 42-story tower at the current 13 Coins site, but the restaurant and developer are working to keep 13 Coins in the neighborhood for decades to come. When branding agency Graphica Inc. moved from Magnolia to South Lake Union in 1996, it wasn’t landing in a hip location. “It was ghost town-ish,” CEO and cofounder Kim Falcon says. The company moved into a building freshly renovated by the Low Income Housing Institute—they had been told it was previously a rundown spot where grunge bands practiced in the basement. Graphica remains in that same office space 20 years later, and Falcon’s business has grown along with the neighborhood. As life science and technology companies sprung up, Graphica earned their business and started designing their annual earnings reports and other materials. Word spread of the agency’s excellent work and its clients now include many of the neighborhood’s major science firms, including Seattle Children’s Research Institute, Seattle Cancer Care Alliance, and Fred Hutch. Today, Graphica devotes more of its time to branded environments. By customizing office design elements—including the entire Juno Therapeutics campus and the 400 Dexter building—Graphica is helping define the neighborhood’s aesthetic. 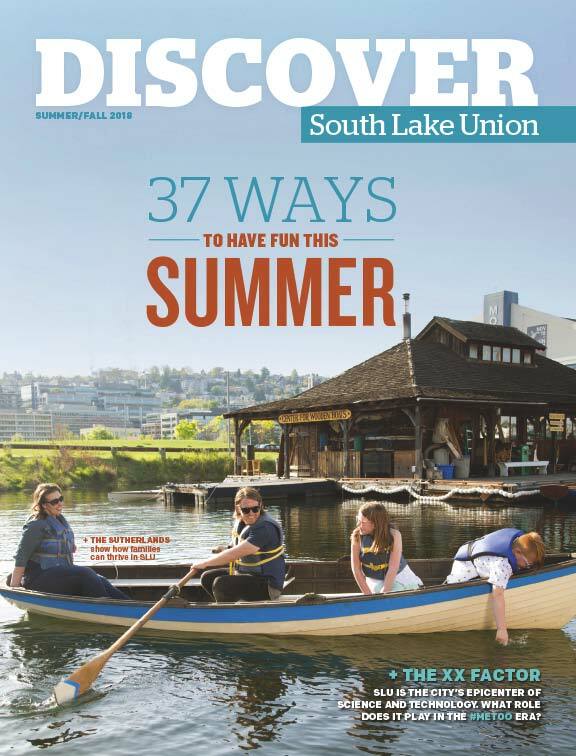 To read about more lasting legacies, pick up the Summer/Fall 2017 issue of Discover South Lake Union magazine. Story by Jake Bullinger and Photos by Stuart Mullenberg. Founded in 1946 along the shores of Lake Washington, Kenmore Air has offered flights from Lake Union for decades. Known for its high-backed swivel chairs and booths, 13 Coins has been serving everything from benedicts to steaks 24 hours a day, seven days a week, since 1967. As life science and technology companies sprung up, Graphica Inc. earned their business and started designing their annual earnings reports and other materials.